Auto-pointing, Line-Up, HD Encoder Config. 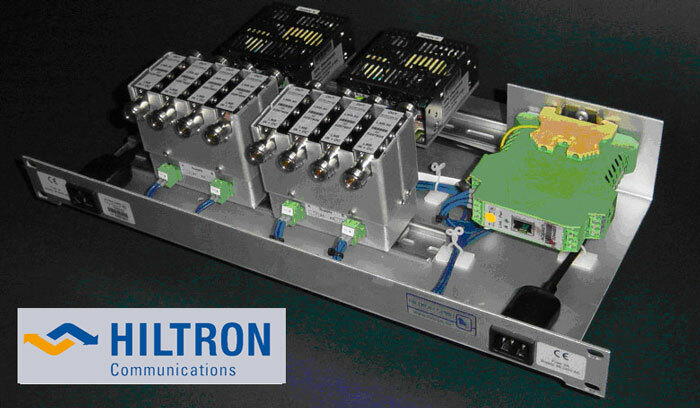 Hiltron is a proven and established supplier of SATCOM specialized equipment and related software products, with a rich history of unique and reliable controllers, including the Hiltron HSACU three axis DSNG antenna controller. 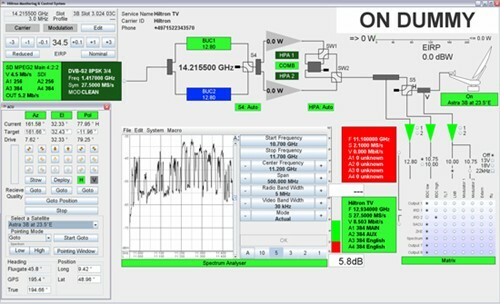 HMCS is the most economic and flexible DSNG monitor & control software enabling DSNG operators to connect their system to the satellite (auto-pointing, line-up, setting of HD/SD encoding parameters) in a few minutes only. Hiltron’s unique flexible HMCS monitor&control software product is the flagship for DSNG and small satellite systems ideally suited for any modern HD MPEG-4 DSNG vehicle for interactive user-friendly assistance of the whole up- and downlink chain. The Hiltron HMCS software package is the most advanced on the market for several reasons and a must for any new HD DSNG truck or an ideal replacement of an existing older control system. The Hiltron HMCS software is completely hardware independent due to its design in Java. It uses a modern graphical user interface with sophisticated alarm message handling and provides a highly intuitive and efficient way for a professional satellite line-up procedure. It is fully integrated with market leader HD encoder/modulator hardware and with Hiltron’s latest fully auto-pointing DSNG HSACU antenna control unit. GUI, a line-up assistant, and a transponder database. Fully integrated with Hiltron’s new HSACU Antenna DSNG control unit for state-of-the-art auto-pointing functionality. Integral satellite transponder and encoding profile data base. 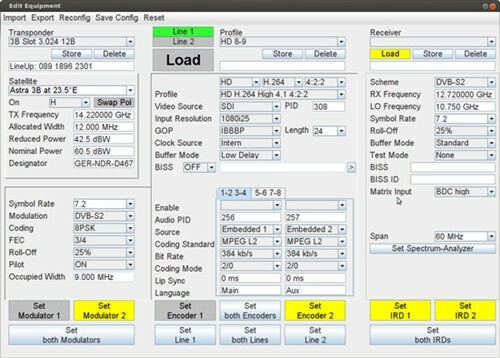 Fully integrated with Ericsson’s flagship HD/SD MPEG-2/4 encoder/modulator Voyager II and others. Fully platform independent, completely written in Java. Does not require special hardware. Software installation within some minutes. Very intuitive graphical user interface (GUI) with alarm based colour coding (refer to figures at the left). Optimized DSNG workflow with a minimum of mouse clicks. Integration of customer specific equipment on request. Any DSNG operator who wishes to have user-friendly assistance of his uplink procedure with minimum investment (re-use of existing hardware and equipment).